10.15% Manappuram Finance NCD - Jan'19 – Should you Invest? 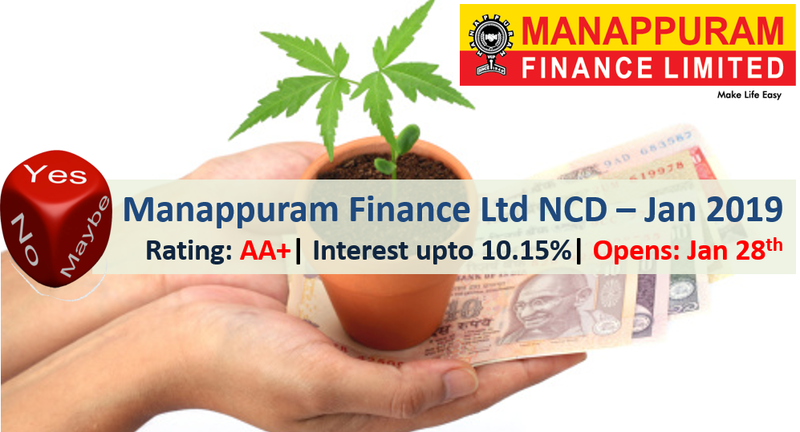 Manappuram Finance Limited has come out with latest NCD (non-convertible debentures) offering up to 10.15% interest rate. The issue opens on January 28 and closes on February 27 , 2019. Manappuram Finance Ltd is one of the major non-banking financial company in the gold finance business situated in Thrissur, Kerala. It has over 3200+ branches across 25 states, a staff strength of over 15,000+ people. It provides loans against the pledge of household and/or used gold jewelry and provide short-term personal and business gold loan primarily to retail customers. There are 7 options of investment in Manappuram Finance NCD. Manappuram Finance NCD – Who can Apply?